My wife doesn’t quite understand my obsession with knowing if the head chef is in the kitchen when we eat out. Chefs train their subordinates to execute their vision, she argues, so there’s no reason to believe that quality will suffer just because the chef took the night off. In an ideal world, she’s probably right. But as everyone knows — and as we’re reminded every day — we don’t live in an ideal world (indeed, if things get any less ideal Don Lemon may have an on-air aneurism). In the real world, I’m convinced that having the head chef in the house makes a difference — not a huge difference, but enough to alter the experience. 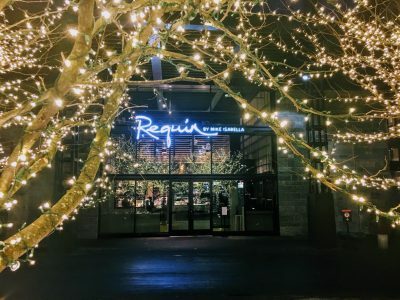 At least that’s the best explanation I have for my recent dinner at Requin at The Wharf, which could be dubbed The Tale of Two Requins. 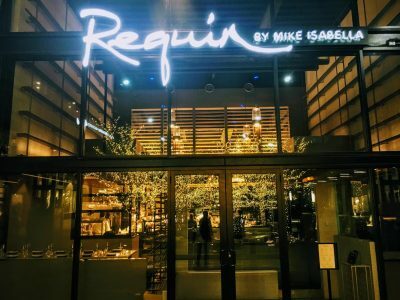 Mike Isabella opened Requin #1 in Merrifield in late 2015. He brought in fellow Top-Chef alum Jennifer Carroll to help open it and run the kitchen (one of Isabella’s strengths is attracting first-rate chefs). Carroll endeared herself to me on Top Chef as a blue-collar badass from Philly who didn’t take a single piece of crap from anybody — but was always hardest on herself. She brought that lunch-bucket attitude to DC. I ate at Requin #1 maybe a half dozen times while she was in charge and every single time Carroll was there, manning the pass the whole night, inspecting and finishing each and every plate that went out to the dining room. It wasn’t so much that she was sending plates back to the kitchen. She didn’t have to. The line cooks knew their plates had to go through her and it affected their cooking. Aren’t they professionals who would have worked just as hard had she not been there? Sure. But they’re also human beings and because she was there I believe they paid that extra bit of attention to make sure their plates passed muster. And it showed. In all my meals at Requin #1, I don’t remember a single clunker. That’s not so much because the dishes were well-conceived — although they were — but because they were well-executed. True restaurant fails are due a lot more often to poor technique — over/under-cooked proteins, over/under-salting, etc. — than poor conception. That was never a problem at Requin #1 because Jen Carroll stood astride the line like Gandalf refusing to let poorly-executed dishes pass. Which brings us to Requin #2, aka Requin at The Wharf. 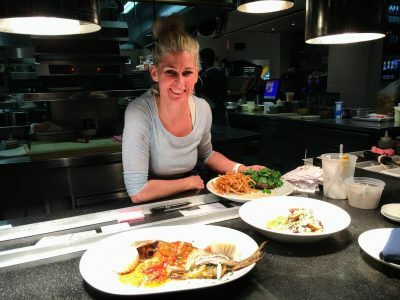 The original plan was that Chef Carroll would help open the new location, although it was unclear whether she’d reprise her hands-on role from Requin #1 or move into some type of management role. I hoped it was the former. Not only did her talent deserve a bigger stage, but I selfishly knew I’d get to eat her cooking more in DC than in Merrifield. But then last October Chef Carroll abruptly left Mike Isabella’s restaurant group. Why is still a mystery — at least I haven’t seen any explanation — but her departure left Requin #2 in the lurch just weeks before opening. 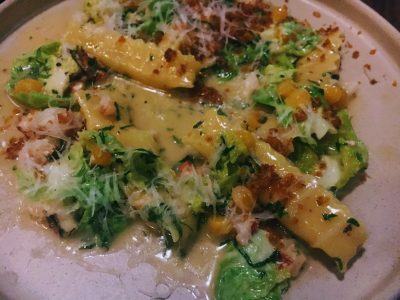 Happily, Isabella tapped Chef Michael Rafidi to run the Requin #2 kitchen. Rafidi is the talented Executive Chef at Arroz, one of my favorite new restaurants of 2016 and another restaurant where I’ve never had a bad dish. On paper, it sounded like a workable solution. But you don’t eat dinner on paper. Unless you’re at a crab shack, but that’s beside the point. The catch was Rafidi wouldn’t be leaving Arroz; he’d be running both kitchens. Running two kitchens by definition means you can’t devote your full attention to either. So it wasn’t surprising that Chef Rafidi wasn’t there the night I visited Requin #2. Was it just coincidence that the cooking was sloppier than any meal I had at Requin #1 or Arroz? Maybe. But with Requin #2 sharing so many of Requin #1 and Arroz’s direct bloodlines, from Isabella to Rafidi to Carroll, the one obvious difference is the absence at the top. To be clear, that doesn’t make Requin at The Wharf a bad restaurant, just not a particularly memorable one. Would it be different when Chef Rafidi is in the kitchen? As much as I’d love to know (1) I’m not willing to take the chance of his not being there, particularly at these price points, (2) maybe I’m wrong and I’d just be throwing good money after bad (see point #1 re price points); and (3) there are just too many other new restaurants in DC to check out to be giving out a lot of mulligans. Oh yeah, I almost forgot. Here’s the actual dinner. Requin’s interior is dominated by the open kitchen and bar with tables ringing the perimeter. The main dining area is a somewhat cramped and awkward space with only a single row of tables ringing the bar. It feels more like you’re eating in the bar area than a dining room. Hopefully those glass doors will open in summer months and provide some air and openness. 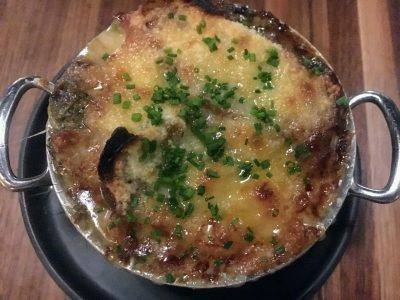 This deeply-flavored onion soup suffused with thyme is a good rendition of the classic, the oxtail adding a deep beefiness to the broth. My only quibble is the addition of shredded oxtail meat, which feels like gilding the lily and distracts from the focus on the onions. While Requin devotes an entire section of the menu to “Les Tartines” (aka toasts), this vegetarian option was a miss. The cauliflower was undercooked and the chili crème fraîche and parmesan didn’t add much interest. Tail Up Goat can rest easy. These aren’t in the same league as their inventive toasts, which remain one of the best things in DC since, well, sliced bread. Another miss. It’s fine to put a twist on a classic, but your twists had better improve on the original. 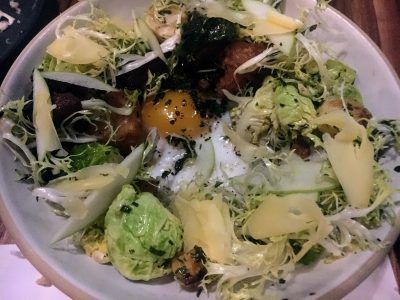 Here, you could try to to finely shred raw Brussels sprouts as a stand-in for Salade Lyonnaise’s usual frisée, but chunks of undercooked sprouts don’t work. The lardons, on the other hand, were delicious and the apples provide some nice crunch and acidity. There’s a lot going on with this dish but it works. Pumpkin filling can sometimes dominate a plate but here it’s subtle and plays well with the other luxe ingredients. The espelette helps cut the dish’s richness as well as provide a bit of crunch. 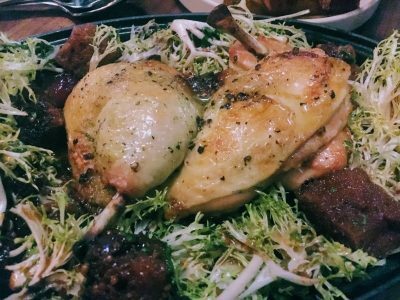 The best savory dish of the evening was Rafidi’s homage to the famous chicken at Zuni Cafe in San Francisco. Both white and dark meat were beautifully cooked and well-seasoned. Take a bite of chicken with a piece of the bread confit and wilted chicory, swab it through the mustard jus, and it’s hard to beat in its simplicity and deliciousness. A bit crisper skin and it’d be just about perfect. I had high hopes for this dish based on some of the reviews I’d read, but it came out as a hodgepodge of flavors and plating. The duck breast was a bit tough and under-seasoned. The confit was better, well-rendered and tasty, but, as with the chicken, the skin could have been crisper. And once again the veggies were underdone, which you can get away with with some vegetables but you can’t really do with turnips. This one baffles me. 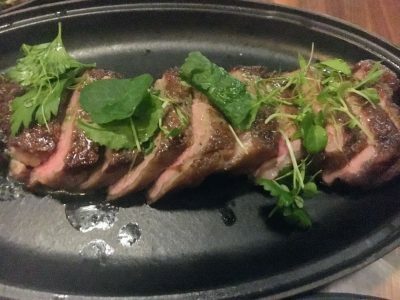 How does a french bistro send out this mediocre steak for $48? It was hard to tell if the problem was the quality of the meat or the cooking, but it lacked beefiness and juiciness. It was also under-seared, with a wan crust, which is clearly an execution issue. 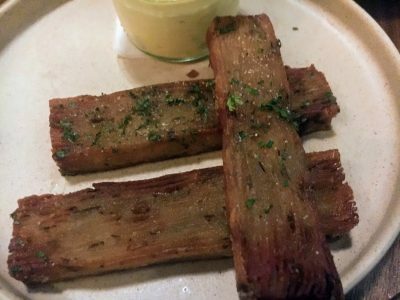 And if you were expecting a pile of hot and crispy frites with your steak-frites, think again…. We ate a couple before I got this pic, but you get the idea. These multi-layer girders are a feat of culinary engineering and undeniably delicious. If you’ve had the patatas bravas at Arroz — and if you haven’t, go now — you’ll recognize the technique. In any other context, I’d gobble these up and be thrilled. But not with my steak-frites. When I get steak-frites the only acceptable frites are shoestring fries. This is like one of those restaurants where you order a hamburger and fries and the fries turn out to be potato wedges. Experimentation has its place, but sometimes the line has to be drawn. Along with the chicken, my other favorite dish of the night. 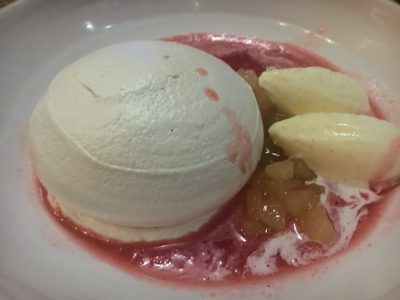 An excellent meringue with a crisp shell and soft interior, complemented nicely by roasted pear, pear ice cream and striking red current coulis. So there you have it. 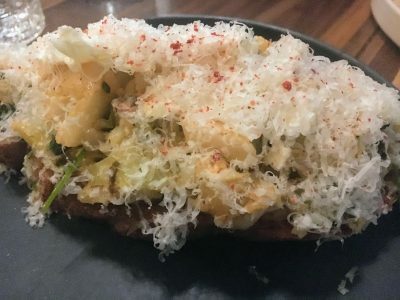 Requin at The Wharf has some very good dishes but also skins that weren’t crisp, meats that weren’t properly seared and vegetables that weren’t cooked through. It all adds up to a B- experience from a team of A performers. It’s like the Tom Hanks movie, The Circle. 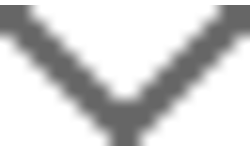 You probably never saw it. It was a sci-fi thriller released last summer starring Hanks and Emma Watson. It was fine but not great. With that cast, it seems like it should have been better. It makes you realize just how thin the line is between great and merely good. 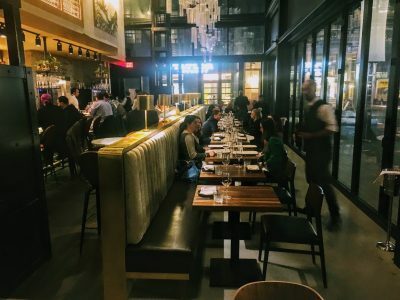 Requin at The Wharf may be Mike Isabella’s The Circle but I wouldn’t worry that he’s lost his touch or is over-extended. He’ll be back with The Post before you know it. 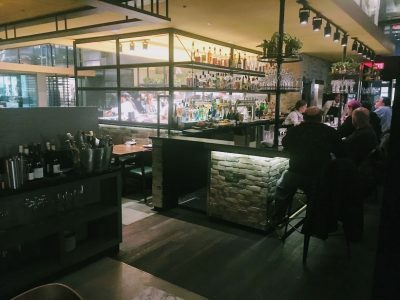 This entry was posted in Articles, Restaurants DC, SW. Bookmark the permalink. I had such a different experience, despite the fact that Chef Rafidi was also not on the kitchen when we dined here. 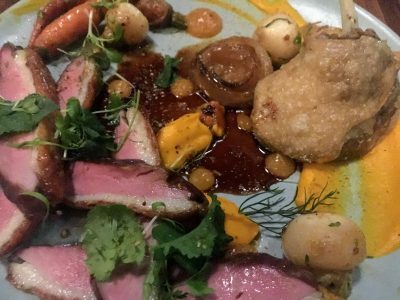 I absolutely loved the duck dish- every element was well prepared and I thought the taste was sensational. We may have had different people preparing the dish on the nights we were there- who knows. It just goes to show that every restaurant has good nights and bad, and variations on the same dishes on different nights. But the steak frites is indeed a sad saga!